What is the Mexican Monsoon? What is a Monsoon Burst ? or a Monsoon Break? What is a Gulf of California Moisture Surge? Why do thunderstorms occur during the summer? Weather patterns associated with severe thunderstorms. What is a monsoon thunderstorm? Yes, indeed! Contrary to the denials of Arizona old-timers, we here in the Southwest do have a "monsoon". Actually one of the reasons that India has its more famous monsoon is largely due to the huge Rajasthan Desert in western India. But more fundamentally a 'Monsoon' is linked more to a wind shift rather than precipitation. In fact, the name "monsoon" is derived from the Arabic word "mausim" which means "season" or "wind-shift". Again, for India, during the winter dry period, the airflow comes from high pressure to the north�the dry Himalayas and Siberia. For the summer, the desert of western India heats up and low pressure forms. This causes air to swirl in from the west, the south and the east�all oceans! The result? HEAVY RAIN! The Arizona Monsoon: - is a well-defined meteorological event (technically called a meteorological 'singularity') that occurs during the summer throughout the southwest portion of North America. The Arizona Monsoon, is the northern extension of the Mexican Monsoon. During the winter time, the primary wind flow in Arizona is from the west or northwest�from California and Nevada. As we move into the summer, the winds shift to a southerly or southeasterly direction. Moisture streams northward from the Pacific Ocean and the Gulf of Mexico. This shift produces a radical change in moisture conditions statewide. These two features combine to create strong southerly flow over Arizona. The southerly winds push moisture north-ward from Mexico. The exact source region for the moisture of the Arizona monsoon is unknown. Researchers have proposed the Gulf of Mexico and/or the Gulf of California as the source regions but conclusive evidence has so far been elusive.This has lead to the creation of large data-collecting efforts and research programs such as SWAMP, the South-West Area Monsoon Project. during the months of July through September. It is associated with a dramatic increase in rainfall that occurs over what is normally an arid region of North America. Monsoon. The similarities between the two monsoons include a shift in the mid-level flow from westerly to easterly, the mean diurnal low-level flow changes form offshore to onshore, extremely hot and dry conditions preceeding the onset rainfall and a rapid increase in the areal coverage of rainfall during the early summer. The Summer Season Pattern Shift. In June the 500 mb subtropical ridge (18,000 feet above sea level) is located over northwest Mexico. As a result, the flow across Arizona is usually from the southwest. The hot and dry weather conditions experienced across Arizona during the month of June are a direct result of the position of the 500 mb subtropical ridge and dry southwest flow. By July the 500 mb subtropical ridge normally shifts northward with the center of circulation located over west Texas and New Mexico. As a result easterly flow develops over northwest Mexico in the mid-levels and hot temperatures over the continent result in a general onshore flow in the low-levels. The shift in the 500 mb subtropical ridge is followed by a dramatic increase in thunderstorm activity over northwest Mexico. Arizona lies on the northern fringes of this area of enhanced thunderstorm activity. 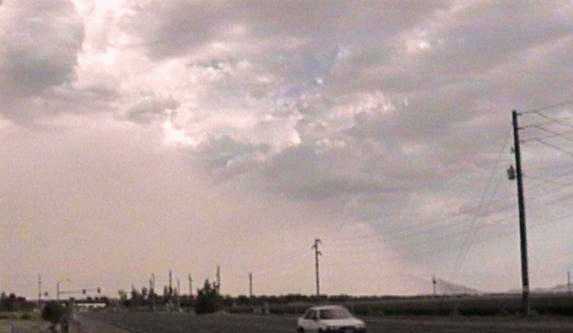 It is during this time that Arizona experiences periodic increases in moisture from the south and east that can lead to thunderstorms. Regional Rainfall Characteristic During the Mexican Monsoon. The map below shows the average rainfall in millimeters over northwest Mexico and the southwest United States for the Month of July. On average 150 to 300 mm of rainfall occurs over the mountain foothills of northwest Mexico during the month of July (from WMO 1975 Atlas). One hundred and fifty millimeters is about 6 inches, this is a lot of rain in anybody's book for just one month! Below is an analysis of the contribution of the monthly mean rainfall to the annual total for the months of June and July. Over northwest Mexico only 1 to 5 percent of the annual total rainfall is recorded in June. But look at the July chart, from 20 to 30 percent of the mean annual rainfall occurs in July over northwest Mexico! This gives notice to the dramatic changes that take place in Mexico from late June until early July as the subtropical ridge shifts northward. The Mexican Monsoon begins in July and lasts through September. The chart below shows in percentage the contribution during these three months to the annual rainfall total. From 60 to 70 percent of the annual rainfall occurs during these three months across northwest Mexico. The plots shown below show the frequency of the occurrence of cloud-top temperatures less than -38 degrees Celsius (thunderstorms) for June, July and August are quite revealing. There is a dramatic increase in coverage of thunderstorms between June and July over northwest Mexico and much of Arizona. The images show that the area of highest thunderstorm frequency is over the western slopes of the mountains of northwest Mexico. Arizona is apparently located on the northern fringe of this activity. This explains the variability of the monsoon over Arizona. Vertical Wind Profiles and Topographic Influences. Guaymas, Mexico for each month of the year. Note the dramatic increase in the mean relative humidity from June until July. At the same time the mean wind profile shifts from westerly to easterly. This is the Mexican Monsoon. features on either side of the high terrain of northern Mexico. Note the streamlines moving into the central United States from the Gulf of Mexico. Equally interesting are the streamlines from the Gulf of California/Tropical Eastern Pacific into Arizona. This figure illustrates that it is very difficult for low-level moisture from the Gulf of Mexico to make it across the continental divide. While the subtropical ridge shifts northward over the southwest United States the Gulf of California water temperatures rise dramatically. By early July Gulf of California water temperatures have warmed into the mid to upper 80s (Fahrenheit). With an ample nearby moisture source and steep mountainfoothills thunderstorms develop almost daily across northwest Mexico. Monsoon thunderstorms are convective in nature. By that, we mean that the thunderstorms are powered by intense surface heating. In addition, strong moisture influx into Arizona is also required. The operational criterion for the onset of "monsoon" conditions used in Arizona is "prolonged (3 consecutive days or more) period of dew points averaging 55�F" or higher." There is nothing magical, however, about 55�F. It originally was linked to the total amount of water in the atmosphere above the weather station (a precipitable water amount of 1", a quantity thought to be necessary for convective thunderstorm activity). In general, for Phoenix, the temperature limits for the production of monsoon thunderstorms are 100� to 108�F with the optimum temperature being about 105�F. Temperatures needed to produce Tucson's thunderstorms are somewhat lower. The satellite images above illustrates a burst and break cycles that occur over Arizona. During bursts (left) weak areas of disturbance in the atmosphere will cause thunderstorm activity to focus on a small area of the state for a few days to one week. The breaks (right) are when the southerly winds are minimal and atmosphere becomes more stable making thunderstorms unlikely to develop. A Gulf of California moisture surge is a low-level flow of moist, relatively cool air that moves northward over the Gulf of California and into Arizona. 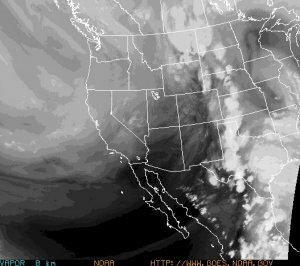 Surges of moisture from the Gulf of California provide the fuel that feeds the wide spread and intense storms that form over the low desert of Arizona. What conditions set-up a Gulf surge? A Gulf Surge can occur whenever the surface based thermal low over the southwest United States is intensifying at the same time large thunderstorm complexes are forming over northwest Mexico. Many of the severe and heavy rain producing thunderstorms that form over the low desert of Arizona during the monsoon are directly related to Gulf of California moisture surges. The most common large-scale pattern observed before a Gulf Surge is an easterly wave passing over central portions of Mexico at the same time mid-level high pressure and very hot weather are plaguing Arizona. 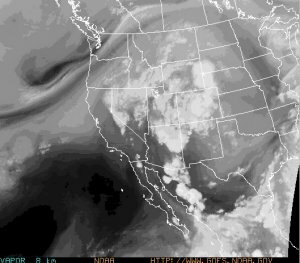 Hot weather normally intensifies the surface based thermal low over the southwest United States. A less frequently observed pattern for a Gulf Surge is when a tropical storm or hurricane is located near the southern tip of Baja California. The realtively cool and moist tropical air mass is essentially pushed northward through the Gulf of California. At the same time Arizona is usually experiencing very hot daytime temperatures with a strong thermal low at the surface. What does a surge look like? Of course not all Surges are created equal. Some surges are shallow and weak with virtually no affect on Arizona except to increase the humidity. Surges of moderate depth and strength can penetrate all the way into Mogollon Rim country with a distinct upswing in convective activity across Arizona. Occasionally, maybe once or twice a monsoon season, a strong and deep surge will find it's way into Arizona. This is when the real fireworks begin! When a strong and deep surge moves across Arizona the fuel for really big storms moves into place. When a big surge passes through Phoenix or Tucson the temperature drops and the humidity skyrockets. It feels like Houston, Texas for a day! Gulf Surges provide the fuel (moisture) responsible for many of the monster thunderstorm complexes that form and ravage the lower desert of Arizona. Storm cells in Arizona are generally short-lived. They usually consist of either Single cell thunderstorms or multicell clusters of thunderstorms and have lifetimes of about 40-50 minutes. Single Cell Thunderstorms - are short lived usually last about 20 to 30 minutes, and these single celled thunderstorms are usually not strong enough to produce severe weather. A true single cell storm is actually quite rare. Even with separate appearing storms in weak vertical wind shear, the gust front of one cell often triggers the growth of another cell some distance away. More commonly they are a multicell cluster of thunderstorms. Multicell Cluster Thunderstorms - consists of a group of cells, moving along as one unit, with each cell in a different phase of the thunderstorm life cycle. As the cluster moves along, each cell takes its turn as the dominant cell in the cluster. New cells tend to form at the upwind (usually western or southwestern) edge of the cluster. Mature cells are usually found at the center of the cluster with dissipating cells at the downwind (usually eastern or northeastern) edge of the cluster. On ocassion these multicell storms can turn into mesoscale convective systems. Mesoscale Convective Complexes and Multicell Line Storms - These systems form on occassion during the Monsoon. They tend to assoicated with Easterly Waves or when a tropical system has enter the state and enhances the Monsoon. Mesoscale Convective Complex (MCC) - Is a large organized convective weather system comprised of a number of large individual thunderstorms, that have becomed organized. It normally persists for several hours and may be rounded or linear in shape. MCCs typically form during the afternoon and evening in the form of several isolated thunderstorms, during which time the potential for severe weather is greatest. During peak intensity, the primary threat shifts toward heavy rain and flooding. The multicell line storm (or "squall line," as it is more commonly called) consists of a long line of storms with a continuous, well-developed gust front at the leading edge of the line. These form on ocassion when easterlywaves or tropical systems enhance the Monsoon. The line of storms can be solid, or there can be gaps and breaks in the line. As the gust front moves forward, the cold outflow forces warrn unstable air into the updraft usually at the leading (eastern) edge of the storm, with the heaviest rain and largest hail just behind (to the west of) the updraft. Lighter rain, associated with older cells, often covers a large area behind the active leading edge of the squall line. Squall lines can produce hail up to about golf ball size, heavy rainfall and weak tornadoes, but they are best known as prolific downburst producers. Occasionally, an extremely strong downburst will accelerate a portion of the squall line ahead of the rest of the line. This produces what is called a bow echo. Bow echoes are easily detected on radar but are difficult (or impossible) to observe visually. 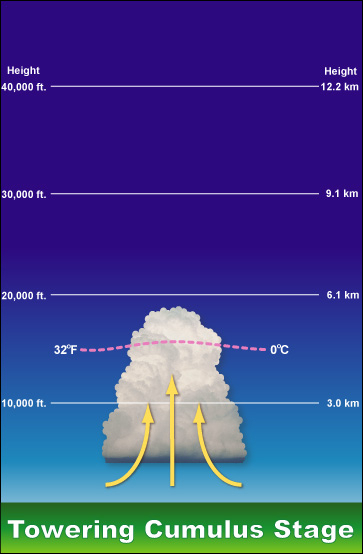 There are three basic stages of thunderstorm development: the updraft cumulus stage, the mature stage and the dissipating stage. The lifecycle of a thunderstorm cell going through these stages is, on average, about 30-40 minutes. 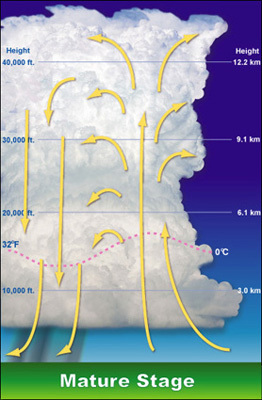 Downbust - Localized pockets of intense downdrafts can create severe weather conditions called "downbursts" . A "downburst" is a strong downdraft that induces an outward burst of damaging winds on or near the surface. Downbursts can be large, called a "macroburst" (2.5 miles or large outflow diameter and damaging winds lasting 5 to 20 minutes) or small, called a "microburst" (less than 2.5 miles outflow diameter with peak winds lasting only 2 to 5 minutes). Therefore, "macrobursts" and "microbursts" are severe conditions of downdrafts. Gustnadoes - Are features that seem to combine some of the characteristics of dust devils) and tornadoes. In essence, a gustnado is a tornado-like vortex that appears to develop on the ground and extend several hundred feet upward. These vortices generally develop along the leading edge of an outflow boundary from a thunderstorm cell. Although generally of limited duration, the winds of gustnadoes can be strong enough to cause damage. 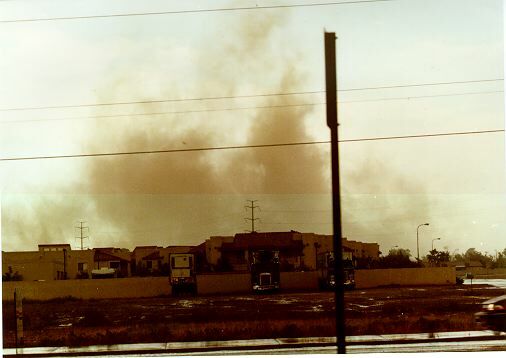 Gustnadoes are often mis-identified as fires. Tornadoes - Luckily, severe tornadoes are fairly rare in Arizona. Although we have many of the weather features (such as abundant moisture, superadiabatic heating, etc.) needed to create thunderstorms of sufficient severity to produce tornadoes, only rarely do we have them all at the same time. 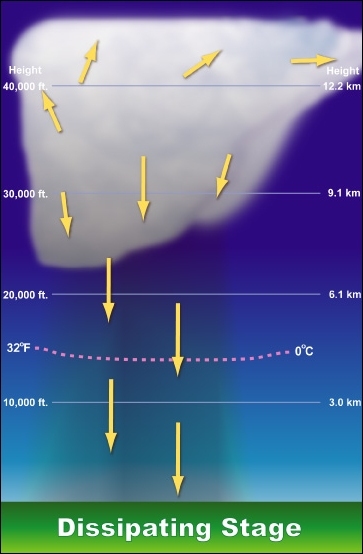 In particular, we often during the summer time fail to have a strong jet stream (a narrow corridor of very strong winds generally found about 6 miles up in the atmosphere) overhead. A jet stream often acts as a super vacuum (creating convergence at the surface) as it aids in sucking up the air from the ground. Winds - Although tornadoes are rare in Arizona, strong winds resulting from downbursts are quite common during the summer thunderstorm season in the desert. Desert storm chasers should be prepared to estimate distant winds. You should realize there is a natural tendency to overestimate wind speeds from observations. Additional monsoon information can be found on the Monsoon Page.